It’s been nine days of wonder and delight and as we near the end of the Cradle of Creativity, the 19th ASSITEJ World Congress and Performing Arts Festival for Children and Young People there is still some time remaining to take yourself or a child to a performance. In 2010, during the FIFA Football World Cup the cries of Ke Nako were heard around the country. That exclamation is confined to the mother city now and will soon be It WAS here, but the atmosphere is no less global or electric. We have been enchanted by pottery puppetry from Spain (A Mano), skipped alongside shoes from Mexico, Brazil and Mozambique (Zapata Busca Sapato) mimicked the moves of Monks from China, (Three Monks) and followed sheep from New Zealand (Transhumance ……The sheep are in town). Active citizenry has been showcased and a number of budding politicians were encouraged by Dear Mr Government, please may I have a meeting with you even though I’m six years old. The perils of autocracy were keenly felt as the fierce women from Animal Farm, gave new meaning and a very contemporary and pertinent feel to George Orwell’s 1945 novel, and the ripples of a revolution were felt in the audience. 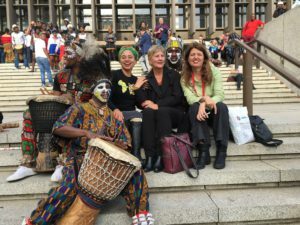 Today, the world celebrates Africa Day and the festival will do so with a programme of outdoor performances including large scale puppets from the sky and the sea. Janni Younge’s Firebird will be accompanied by a reticulated shark proving that there really are no boundaries in theatre. Jungle Theatre’s flying lion will stretch your limits of belief in When Lion Had Wings and an installation commemorating the sinking of the SS Mendi will appear alongside a performance from Ndabamnye No SS Mendi. The performances take place in the Centre Piazza and the Theatre Foyer Well at Artscape from 2pm today. There has been a particular focus on theatre for very young children at Magnet Theatre which continues until the 26th May. 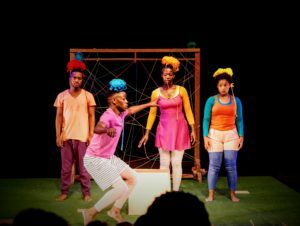 The fringe festival Rocking the Cradle presents ten different productions, one of which is bound to be suitable for a youngster in your care. Anna Newell, a recipient of the Tonic Theatre Award for her role as a woman changing the face of UK theatre, ran intensive workshops at Magnet Theatre in 2015. The trainees were so captivated by her work made specifically for babies that the Early Years Company was formed and it has continued to create, develop and perform several shows which have already gained a loyal following. Creating theatre for children under the age of one may seem an almost ludicrous idea but it is possibly one of the most delightful and sincere theatrical experiences I have ever shared. Babies, together with their caregivers, whether that be their parent or a child minder are ushered in to a purpose built tent. Three actors engage directly with each of the babies with small objects, twinkling lights and tinkling bells. Not a sound is heard aside from gurgles and the occasional deep sigh of wonder from a parent. This is the essence of theatre, a communal experience of wonder and suspended belief, with a tangible sense of shared imagination. Scoop: A Kitchen Play will provide you with the same opportunity. The Goethe Institute and Helios have supported the Magnet Theatre Early Years Company to make several shows. AHA! recently returned from the Helios Theatre Festival, Hellwach 2017 in Germany and is sure to have youngsters marvelling at just exactly what you can do with wool. Making use of ordinary objects is also a feature of Knock! where pieces of wood are transformed into magical creatures, both visually and aurally. Wood takes centre stage in Woodways as the local cast are joined by actors from Cameroon and Kenya. This collaborative project is just one of the many that have made this festival so special. 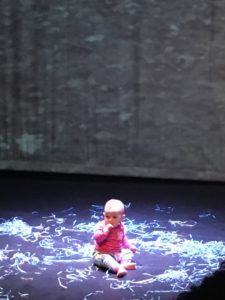 Perhaps children’s theatre lends itself more easily to collaborations which bridge cultures and cross language boundaries. 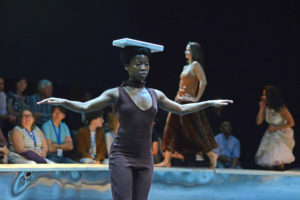 Caban ZA, a research performance using musicians and actors is a collaboration between Belgian and South African actors. Personal and collective memories were explored in Our House, a co-production between Ishyo Arts Centre, in Kigali, Rwanda and the German based Helio Theater. The shared experience of genocide and mass murder examined the past and built hope for the future. Patrice Balbina’s Chance Encounter with the End of the World also dealt with the weighty issue of migration. This multi-lingual performance joined theatres from Europe, Canada and Australia in a truly global project, supported by the European Union. Theatre makers who create work for children are cognisant of the tension between creating theatre that is unadulterated entertainment and work that has a more educational aspect. Many have found the perfect balance and have created performances which are both thoroughly entertaining and from which children can learn. Even a solution for the current crippling drought is to be found on stage. Cloud catcher is a story of hope and determination which follows Buhle, from Langa in her quest to end the drought. Richard Antrobus directs Asiphe Lili in this production which entertains and educates and given the current water crisis is highly topical. Illicit education is the theme of Jon Keevy’s Underground Library where books are forbidden in a futuristic world in Johannesburg where hackers and terrorists race towards the truth. If you are searching for solace or solutions, whether you are a parent of a tiny baby, the aunt of an exuberant toddler or the sibling of a moody teenager, there really is only one place to spend the next few days, celebrating the World Cup of Theatre for children and young people, the very first right here in Cape Town, South Africa. Where and when: City Hall, Baxter Theatre, Artscape Theatre, Magnet Theatre and Cultural Hubs around the city.